Due to its very religious past, in this province, parish registers long served to collect all official documents related to the population and its civil status. This practice was particularly suitable because all the important moments in a person’s life were noted in churches, from baptisms to weddings and funerals. Very early in the history of the province, Quebec also began to deliver and archive documents in order to keep track of the inhabitants by collecting a copy of the parish acts registered by the Church. This is how notarized religious documents came to be housed in courthouses. For a long time, information was collected by religious institutions, which then sent it to the courthouses. The documents were thus duplicated. Gradually, the government’s mandate of storing and preparing these documents gained more and more importance, and in 1994, the Registrar of Civil Status obtained the full mandate. In the 1940s, the Drouin Institute made microfilms of the civil registers of the Quebec courthouses. These documents were gathered to create the Drouin Collection. These documents thus come from both religious institutions and the Government of Quebec. In some areas, the microfilming process continued until 1968, so the Drouin Collection covers the period from 1621 to 1967. During a genealogical search, researchers often find themselves facing documents that were collected by the Church or the government. To better understand the source and nature of the documents they consult, it is important to distinguish religious genealogy and civil genealogy. In the 1621-1967 Drouin Collection, most documents come from the Church. Certificates from parish registers were created, validated and issued by religious institutions. Most of the documents that are in the collection came from the Catholic Church, but you can find certificates issued by other Christian denominations and other religions, including Seventh Day Adventist, Pentecostal, Evangelical, Protestant, Baptist, Orthodox, Methodist and Jewish. To find specific genealogical information—especially that dating back from before the 20th century—you must look at the certificates issued by these institutions. These documents contain information about the people and are often annotated with information that was considered relevant by those responsible for archiving (often parish priests). After the early 20th century, material gathered by the Church began to be used by the state to produce statistics about the population of Quebec. These documents produced by the State are those available in the 1926-1997 Marriages and Deaths tool. These are based on the original certificates produced by the Church and available in the Drouin Collection. The copies of certain documents contain differences. The same certificate may in fact present some discrepancies when one of the two documents is incomplete or damaged, for example. 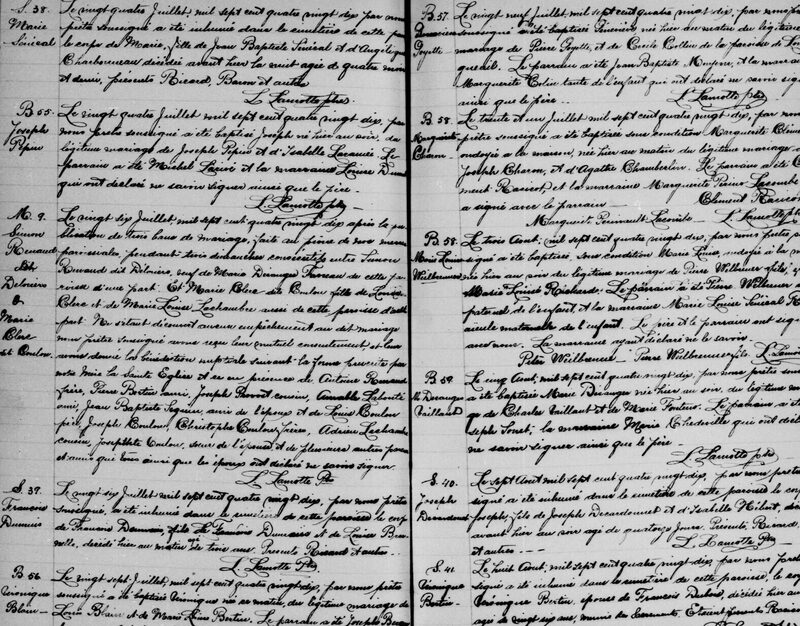 This decision to establish a duplicate recording enabled Quebec to have one of the most comprehensive civil status systems in the world, to the delight of genealogy enthusiasts.